Email marketing is an evergreen marketing strategy. Still, the return on investment (ROI) is higher in email marketing when compared to other types of marketing like social media marketing. 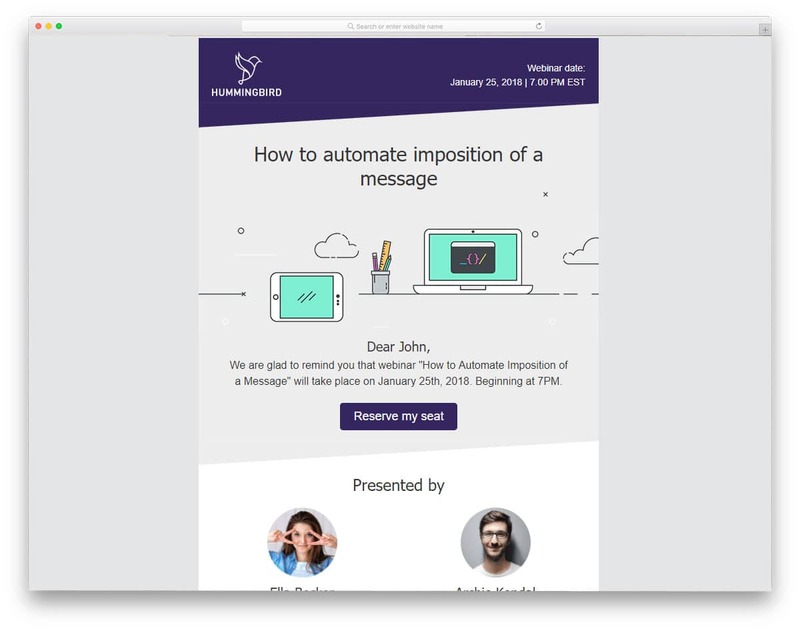 There are several email automation tools out there to help you, MailChimp is the most famous and go-to option for both beginners and professionals. MailChimp not only gives you free plan but also free templates to help you. 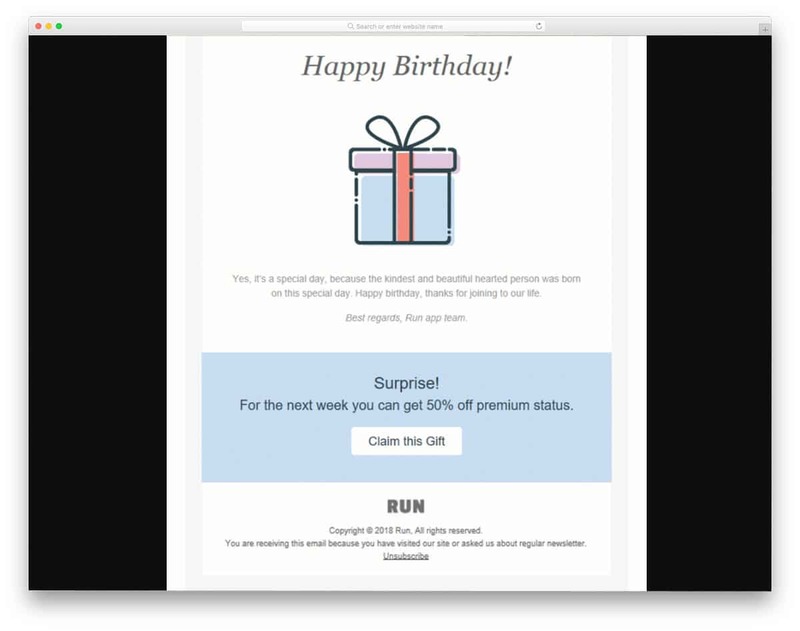 If you are an insatiable person and loves to create a custom one for you, these free MailChimp email templates will help you create one easily. Free MailChimp email templates from MailChimp can be edited easily using the drag and drop builder provided by the MailChimp. The free template collection has email designs for almost all common use, but the MailChimp also provides you the option to upload custom HTML template if you want. There are three methods to upload your custom template. One is to directly copy and paste the HTML code, the other is to upload the HTML file and the last one is uploading ZIP folder of the template. For more detail solution take a look at MailChimp tutorial page. The free MailChimp email templates listed in this post has both downloadable contents and raw code files. As MailChimp gives you the option to use custom HTML code directly you can use all the free MailChimp email templates without any worries. It is always better to start your search from the MailChimp free template collection. All you have to do is to find the template that closely meets your needs. The drag and drop builder of the MailChimp makes customization lot more simpler. Each section in the mail template is treated as a block and the corresponding control settings options are shown in the left screen. Texts editor in the MailChimp editor is very powerful, you can do almost all type of text customizations. You not only can edit texts, you also can edit or add multimedia contents like image and videos. If you are a blogger and send email to make your contents reach more audience, the social media share options will help you spread your contents to a larger audience base. MailChimp also gives you layout design alone so that you can start a template from scratch without any worries. Discount is an image-rich template with bold texts. 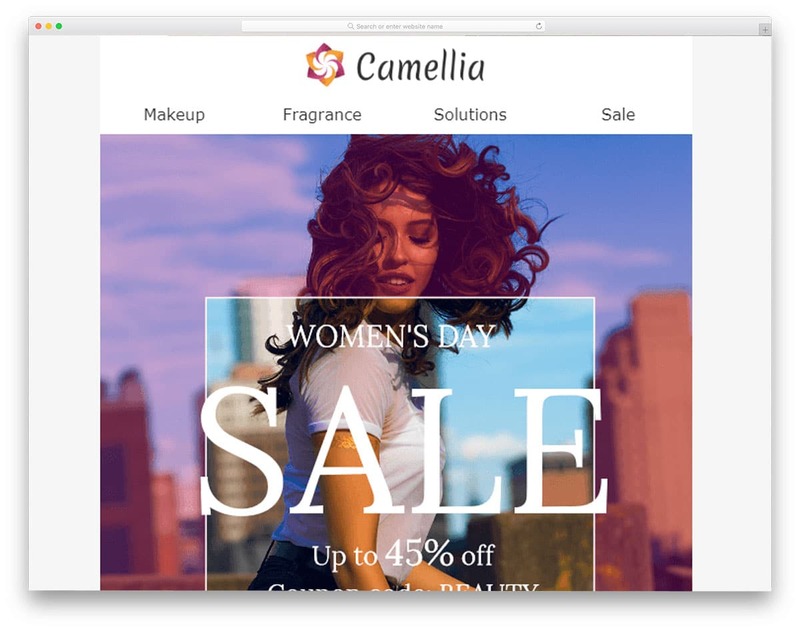 This email template is designed for the promotional purpose, if you are running an eCommerce store or a fashion store this will come in handy for you. This template is made using the email template building tool called Stripo. This tool is almost similar to the MailChimp email template builder. All you have to do is to select the block you want to edit and export it. The Stripo is a freemium tool, which has both a free and paid version. You can directly export the template to the MailChimp format or you can just copy the HTML code and paste it in the MailChimp custom template builder. Another advantage with this template builder is you can adjust the template for the mobile view as well. If you are a minimalism lover, then this template is the best choice for you. Using simple vector images and flat colors are one of the most used design technique in the modern web design. 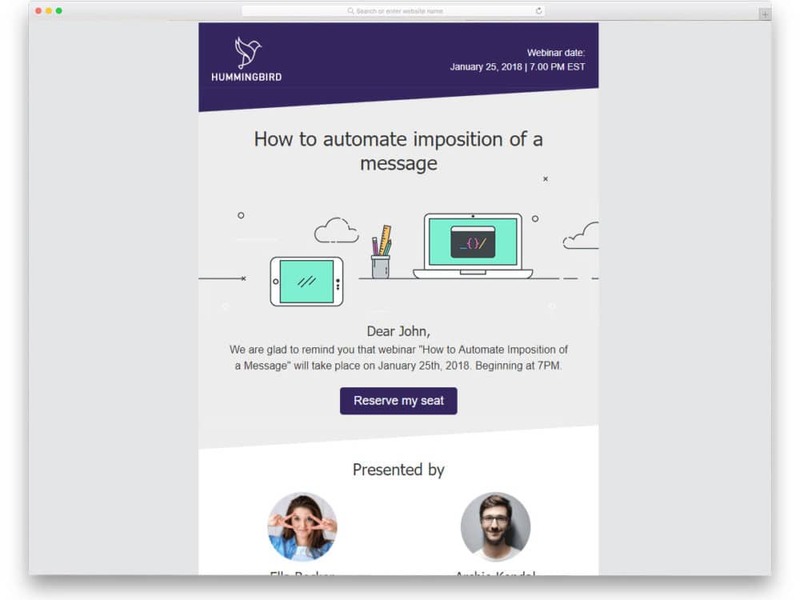 This email template also uses the same design technique. 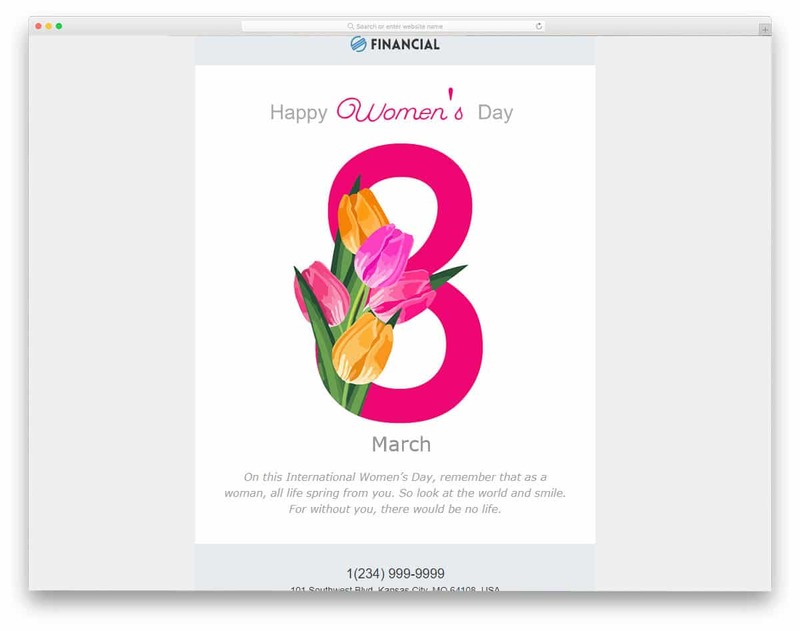 The creator of this template has shared the code he used to create this smart looking email template. You can use the code to create your own custom template or you can make minor tweaks to it and use it. The Codepen editor is a powerful tool used by many developers around the world. In this editor, you can visualize the changes then and there as you customize the template. This template is also made responsive out of the box, so some of your basic template developing chores are already taken care of by the creator of this template. 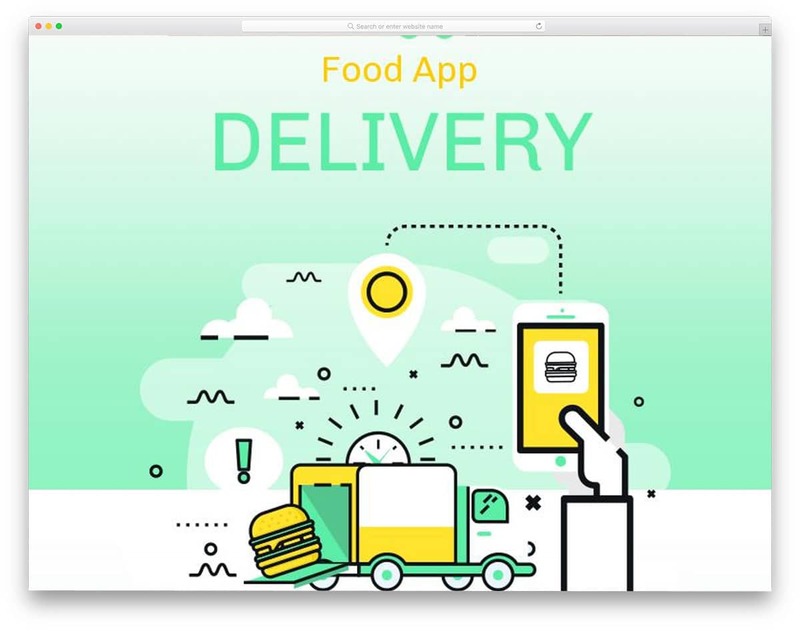 Food Delivery is a mobile app promotional email template. 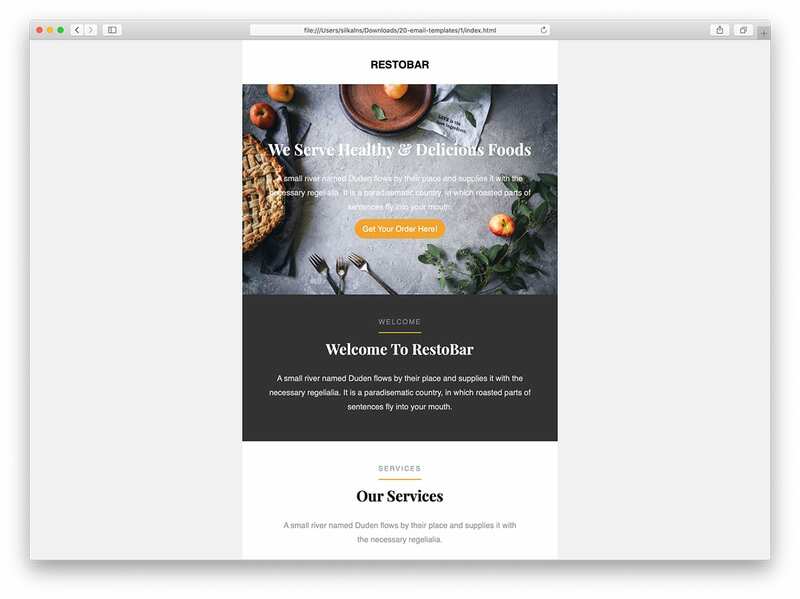 If you are successfully running a restaurant website and wish to satisfy your customer needs via a mobile application, this email template will help you notify your users about the launch of your applications. Sending an email to your existing customers will help you increase app based clients at the initial stage. 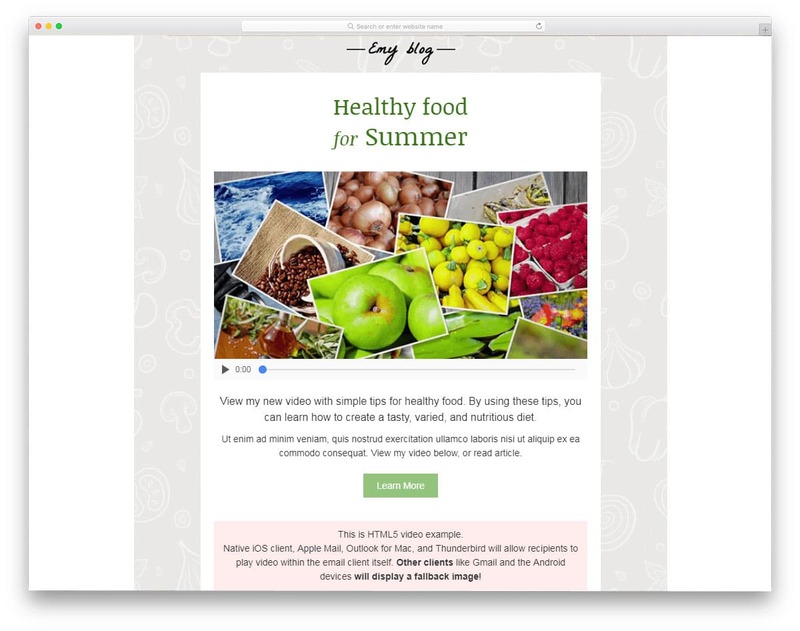 This email template is from the Beefree team, which offers you an email building tool. The creator gives you a free account to use free templates like this. The best part is it is compatible with MailChimp tool. Fashion Discount, as the name implies this email template is designed for fashion stores. Sending a regular email to your customers will help you retain them in this competition rich industry. In this email template, you have space to list the best products and its offer prices. This one is also from the Beefree team, just like the previous template. You get a free drag and drop builder, in which you can add any element you want. The Beefree email builder is compatible with all major email automation tools. Hence, you can use this one without any hesitation. 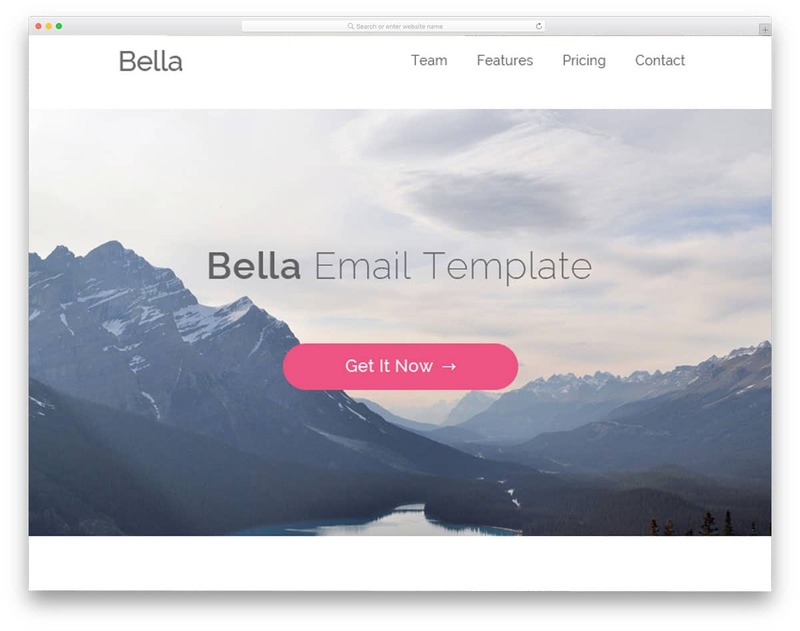 Bella is a long and simple email template, which gives enough space for both text and image contents. The source file of this template contains the PSD files and the HTML files so if you are a developer, these resources will come in handy for you. Lots of white space is given between each segment and elements, which gives a neat appearance to the template. Light stroke texts used in this templates are neat and easy to read. Call to action buttons are also given in this template. 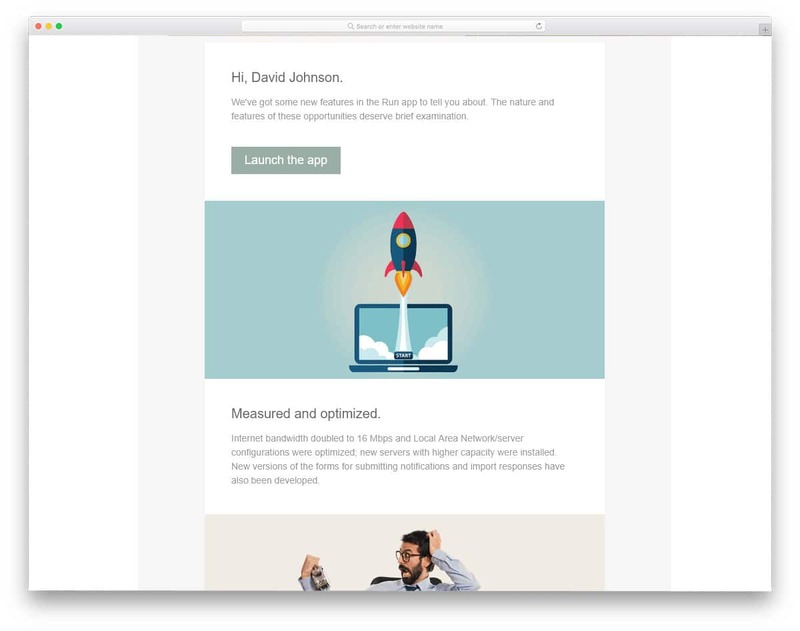 Overall the Bella is a trimmed version of a website template, if you are running an email campaign for a website launch or new product launch, this template will help you create an effective email design. As vacations are approaching, every store owners are running their own discount sales. Already there are news for Black Friday and Cyber Monday. 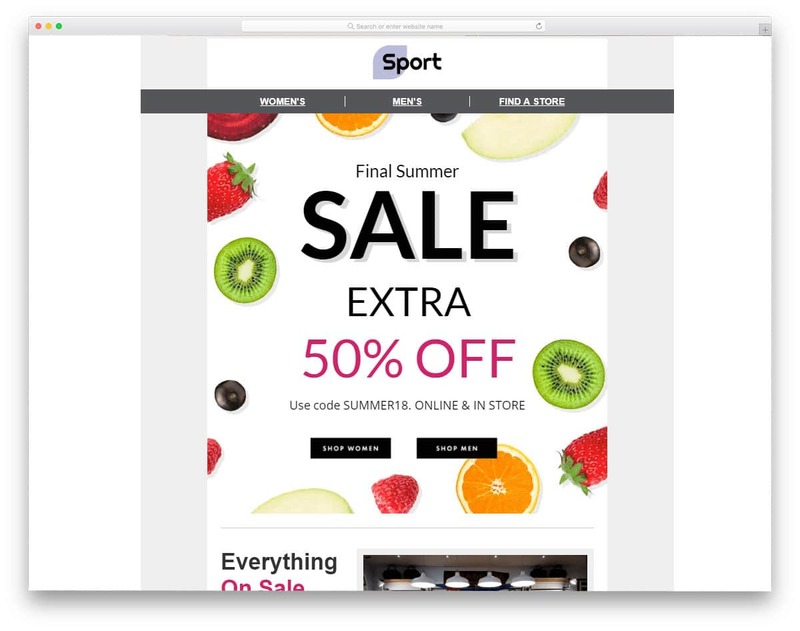 To help you run your discount sale successfully you can make use of this email template for your email campaign. Ample amount of space is given for the images and texts so that you can explain your offers clearly to the users. In the footer, you can add your social media profile links. The designer has used a mini website design with website page navigation options at the top. You can easily customize this template and import into the MailChimp editor. Who don’t like the fresh new look and upgraded features? 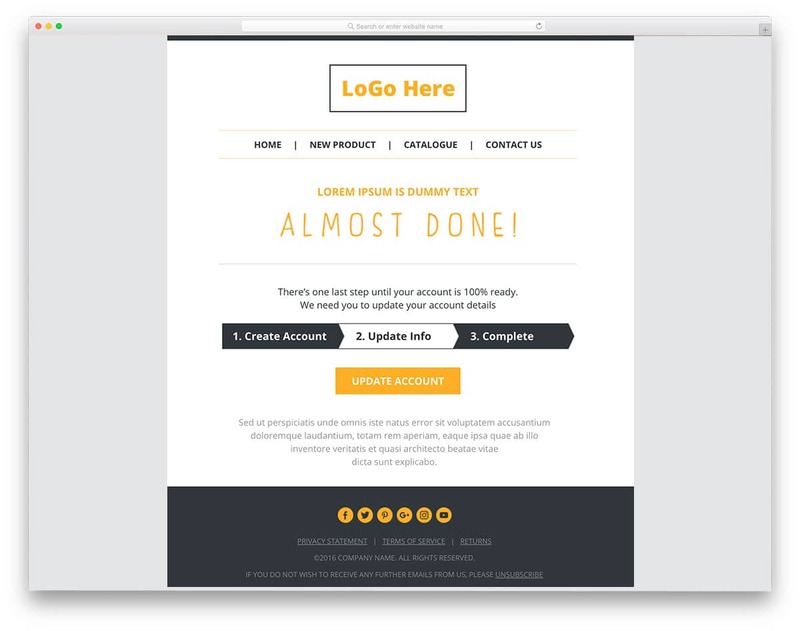 If you are revamping your brand or adding new features this email template will come in handy. For SAAS companies giving a detailed explanation of new features to your customers is a must. This template gives you plenty of space for both image and text contents. As video contents perform better, you can add videos to give a better idea of your new look and interface. The editor in this template allows you to add both Youtube videos and upload your own video. Code editor option is also given in this tool for easier and precise customizations. Back to School Email Template is designed for online course offering websites. The current net savvy generation prefers to learn online courses because of the ease of learning from the place they want. We made a complete list of free education website templates, take a look at it for more student-friendly design. In MailChimp, you have a special option for course emails, in which you can automate the course material in a particular time interval. You can use this template for offers and new course launch. By making few customizations this template can be used for other purposes as well. Bloggers are one of the few peoples who use email marketing effectively. If you are concentrating on the video contents as well, this template is the best option for you. 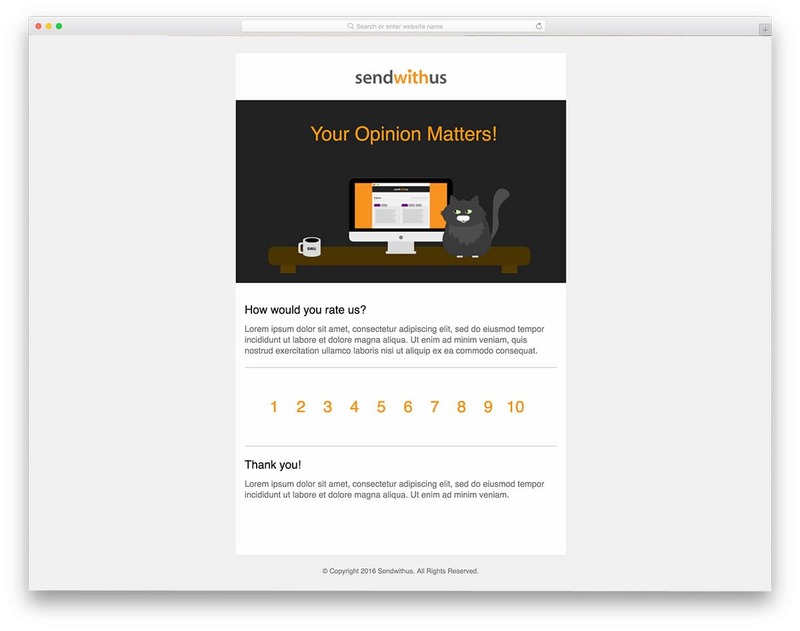 All the modern HTML5 email templates give you the option to add video contents. Since this template uses a what you see what you get, drag and drop editor, you can add video more easily in this one. Ample amount of space is given for the text contents as well so you can give a quick gist of the article. 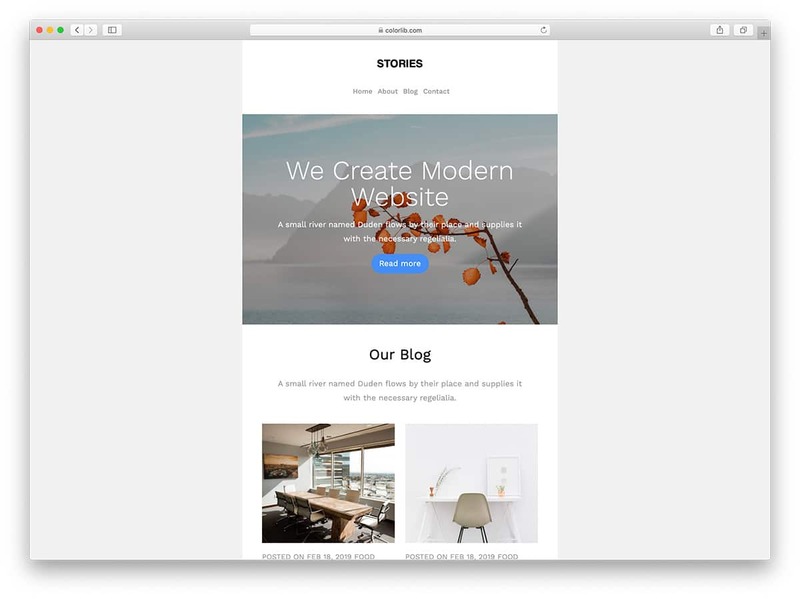 In the default demo, video header is used, you can even use your blog post images here. Organizing the attendees together will make the event successful. Thankfully now you can reach the audience easily in this digital world. Sending an event reminder will help the audience to plan their trip easily. With this template, you also have space to give a quick overview of the event schedule. If you are planning special courses for the attendees, you can also mention it here and let them choose, if they wish to join the course. For event managers, social media engagement is very important. In the footer, you have space to add social media profile links. Running a membership site is not so easy. In order to convert a customer, we have to make a lot of strategies, even though on the verge of getting into your programme the customer might slip away. In such case, you will be using a progress mail to remind the user that he/she is just a few steps away from what they are about to get. The Mantra template is designed for such purpose only. Since you barely know the customer, the designer of this template kept the templates short and clean. With this template, you can directly convey the message to the user. Along with the main content, this template also gives you space for adding other important links. The creator of this template gave us the code directly, so you have to manually use it in your MailChimp template builder. This email template is exclusively for restaurant businesses. As more people are expecting online services in the restaurant industry it is wise to have a website and online business strategy as well. If you are in search of creative restaurant website template for present-day users, take a look at our restaurant website template collections. This template is also designed for promotional and special offers. With bold and big texts this template highlights the important elements easily. More space is reserved for the images in this template, so you can elegantly present your food images and make the user click the button. At the bottom, you have space to add an interactive map, which shows your restaurant location. Providing an interactive map is better than just giving the physical address, the users can reach you easily. 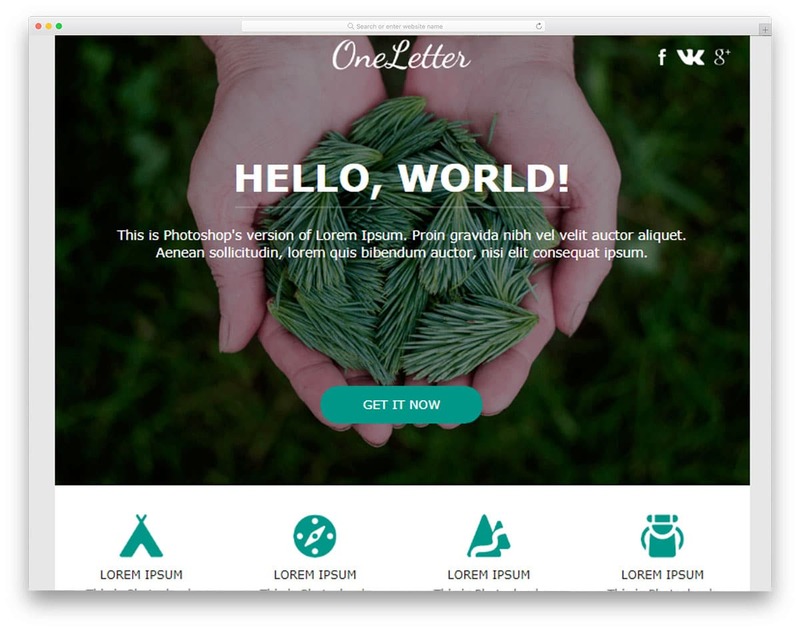 One Letter is a multipurpose email template with a clean design. You can use this template for the welcome message, any new product arrival, and updates. In the header, you have a big hero image with bold texts and call to action buttons. To the top right corner, you have space to add three social media profile links. The icons used in this template are unique and are customized to match the overall design of the template. Call to action buttons are given at both the header and footer to increase the chances of click-through rate. The code used for this template is shared with you directly. With the help of Codepen editor, you can see your customization results easily. 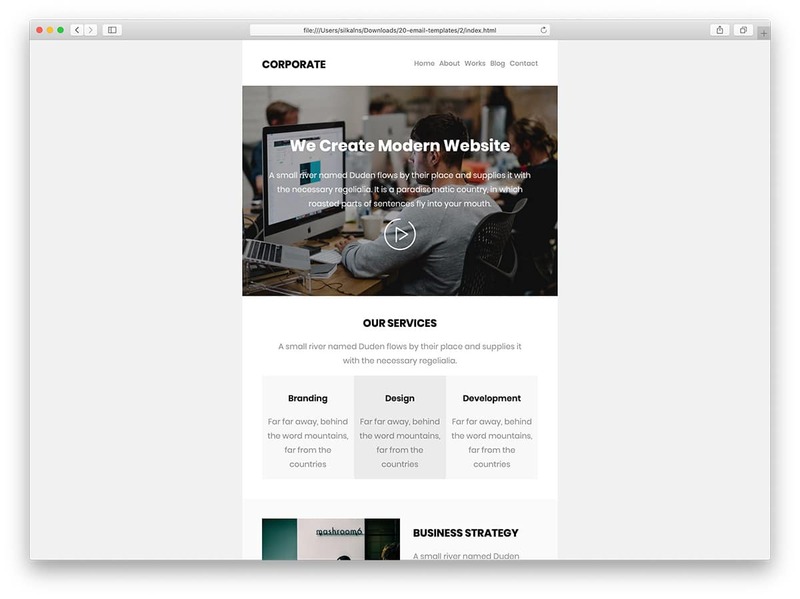 After you are set with the template, just copy the HTML code and use it in the MailChimp template editor. 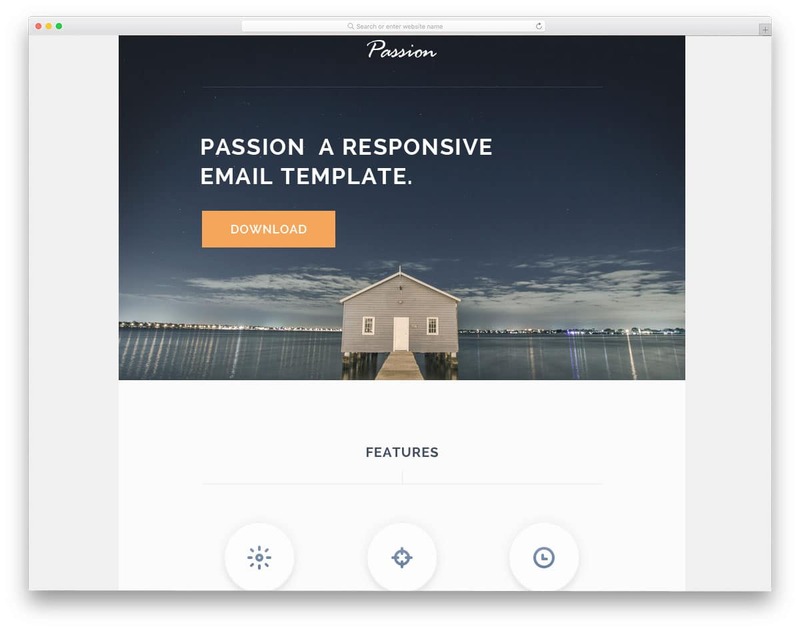 Passion is a perfect email template for the new product launch. Neat segmentations and long layout design of this template give you ample amount of space to describe your product interactively to the users. Depth and shadow effects are used to differentiate and also to highlight the important elements from the rest of the email template design. Tha call to action buttons are made big and attractive to get user attention as they scroll. As this template is designed for existing customers, all the contact details and other links are provided at the footer. Main space is solely reserved for the content of the mail. Neat subtle design of this template makes it the perfect pick for professional use. 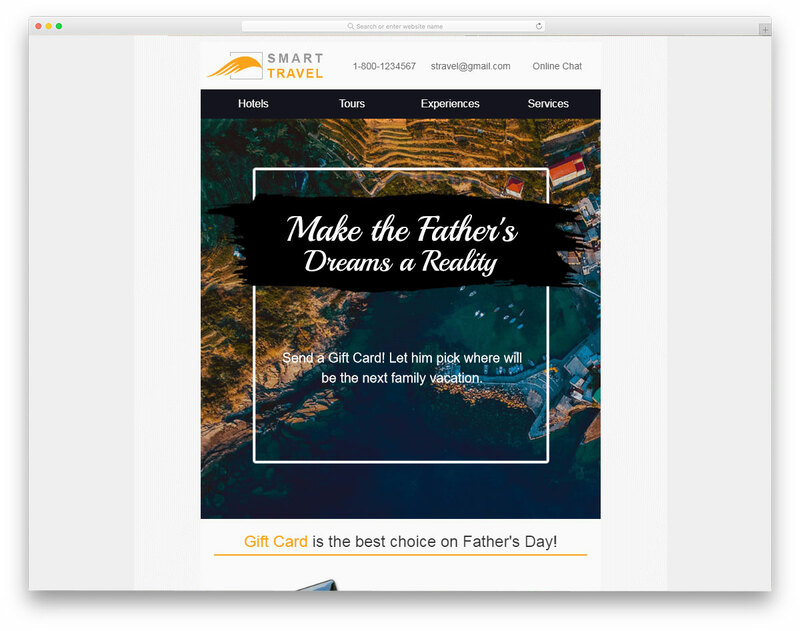 Smart Travel as the name implies this email template is designed for travel agencies. 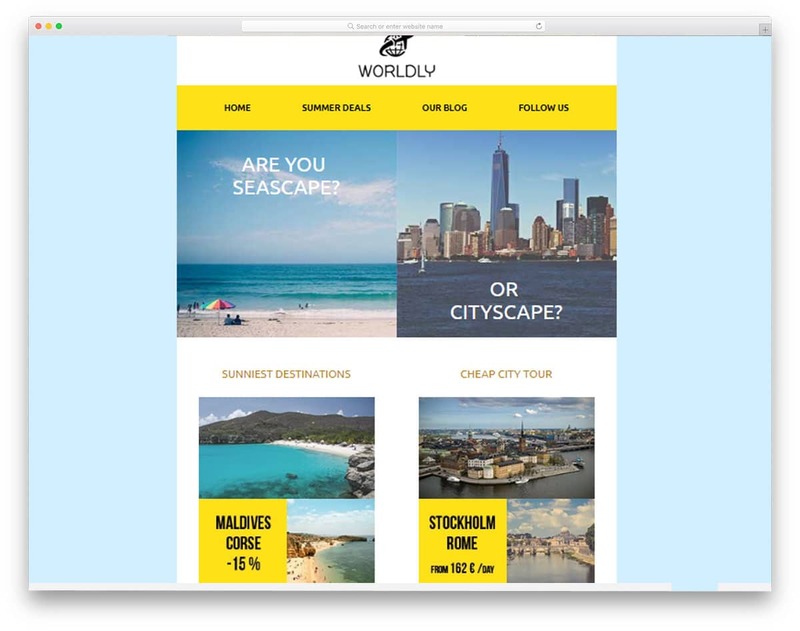 Deals and offers are very common among the travel agencies, speaking of which this template is also made for promotional emails. With the casual cool looking fonts helps you to inspire the user for their next journey. The center space is reserved for the image, where you can add the image of the places you want. Just below the image you have the promotional and offer section. Call to action button is kept just above the footer so that the user can read your email completely and decide to whether or not to take the offer. This template takes a polite and more professional way, you let the user decide rather than pushing them to click the button. 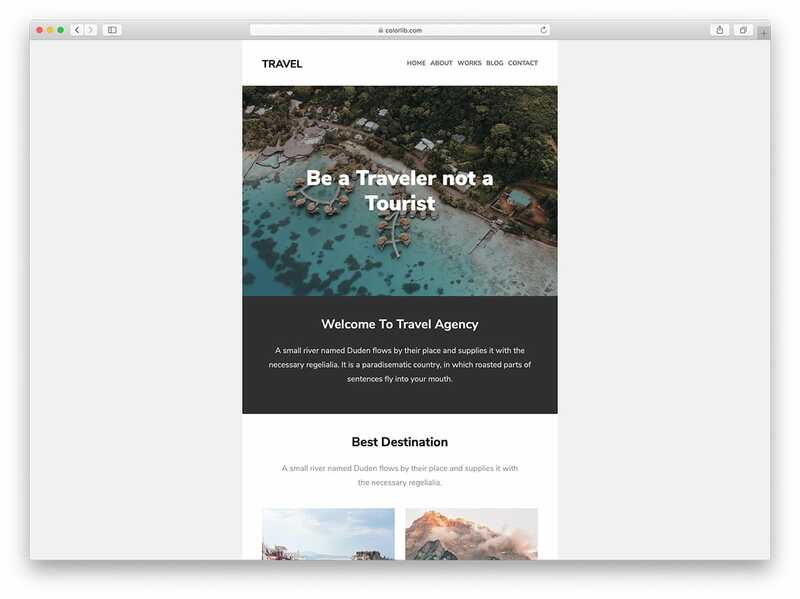 Smart Travel template is also from the Stripo team, so you can edit and export the template easily. 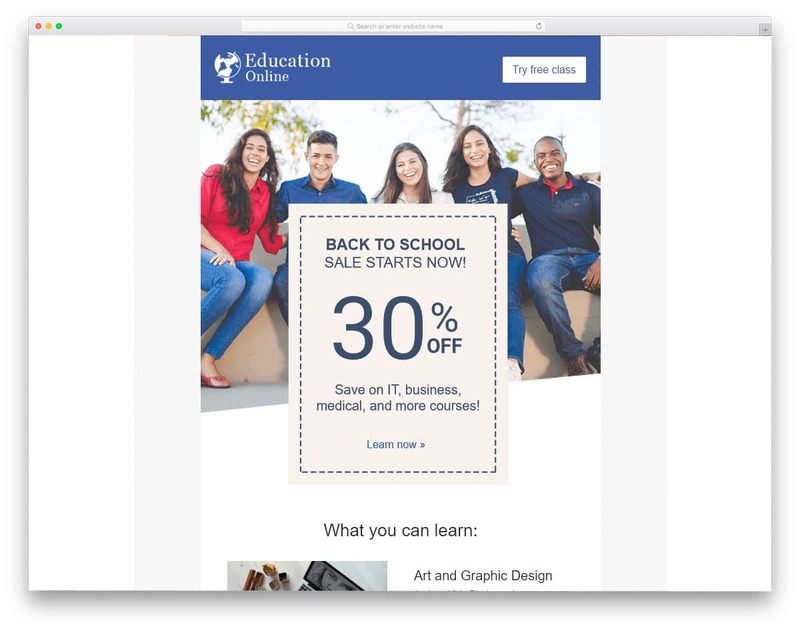 Promotional Email is a layout than a theme based template. The designer of the template gives an open-minded view so that you can create your own template. Image spaces are given at the center and at the top. Of course, the top space is for the logo and the center part can be used for the hero image. The bold neat text helps you to convey the message neatly to the user. Spacings between each element are given perfectly, not too spacy nor very conjusted. The default font itself looks great, but if you need you can change it. The developer of this template has shared the code directly with us. All you have to is to make the changes you want and add it to the MailChimp email template creator. One of the main advantages of email automation tool like MailChimp is the triggered messages. There are certain scenarios which will be the same for all user, you can easily automate this process. All you have to do is to add the template and add the shortcode which will add the username and other unique information into the template. The Confirmation email template is designed to inform the users that their order or request has been received successfully. In the demo version membership confirmation mail for sports website is used. If you are designing fitness websites, please take a look at our fitness website template collection with lots of useful features and trendy design. You can edit the template in the Stipo editor and export it to your MailChimp account. Emails are not always supposed to be static and dumb. Making it different for special occasions will make the recipient happy. In this template, an animated vector image is used for wishing a happy birthday to the user and also to give a special offer. 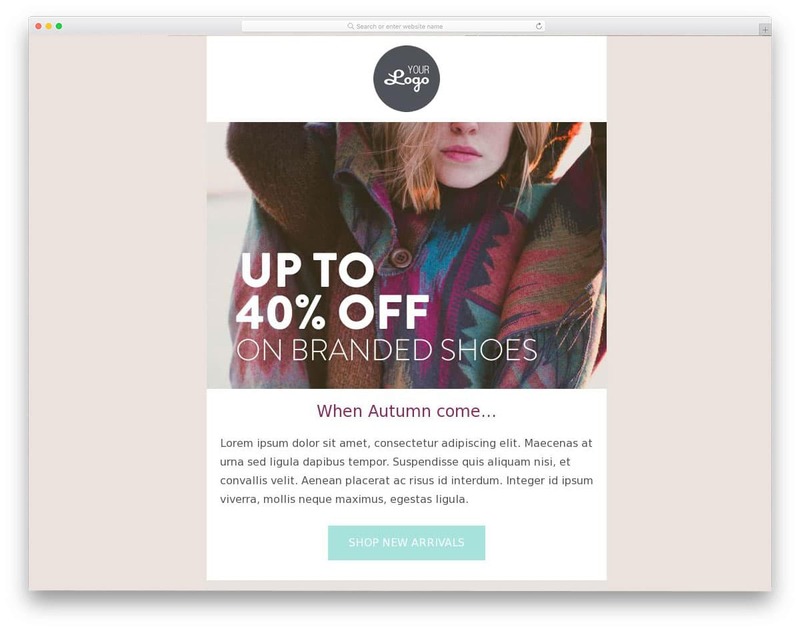 If you decided to use effects in your email template, make sure to keep them simple and neat. Because most surveys share that the flashy email always ends up in the trash, The designer of this template has made it very simple and neat with professional fonts and an ample amount of spacing. Promotional sections are highlighted using a light color to match the minimal design of the template. With this template either you can add and export it to your MailChimp account or you can copy the code and use it in the MailChimp editor. In the data-driven online world, stats not only help you to create unique contents but also helps you to set a new business strategy, In any business, understanding your audience or users is a must, Survey emails help you to get valuable feedback from your loyal customers. This template helps you to be casual with your customer and ask a favor from them. In the header, you have a big space for the image. Just below the image, you have the room for add texts and survey rating. You can even add a link to your survey page if you are using specialized survey services like Survey Monkey. The only thing this template misses is the contact details and branding elements. The developer of this template has shared the code directly with us, so you can edit it and add to your MailChimp email template collection. 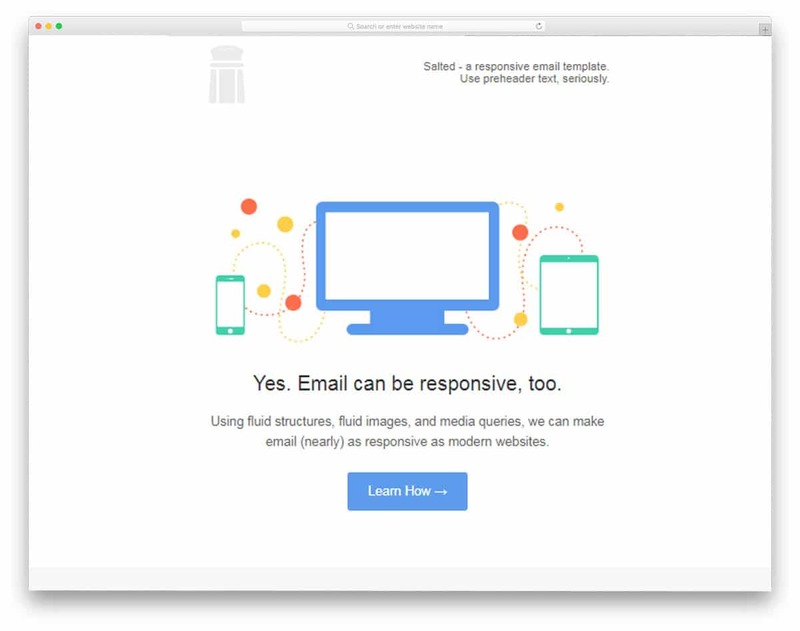 MJML is a famous framework which helps you to create responsive emails in no time. 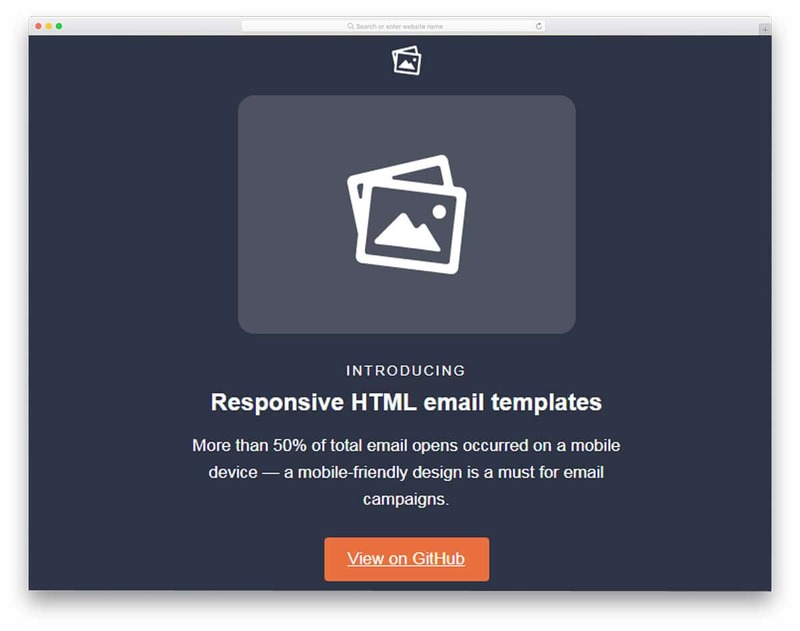 Top email builder tools like Litmus itself uses this framework. If you are a developer you will find this tool useful in your projects. MJML has a clear documentation, take a look at it if you are new to this. Talking about the template, this one is also made for the travel and tour related businesses, This template is full of images and call to action buttons. If you are aggregating the best offers for the holidays, this template will do. 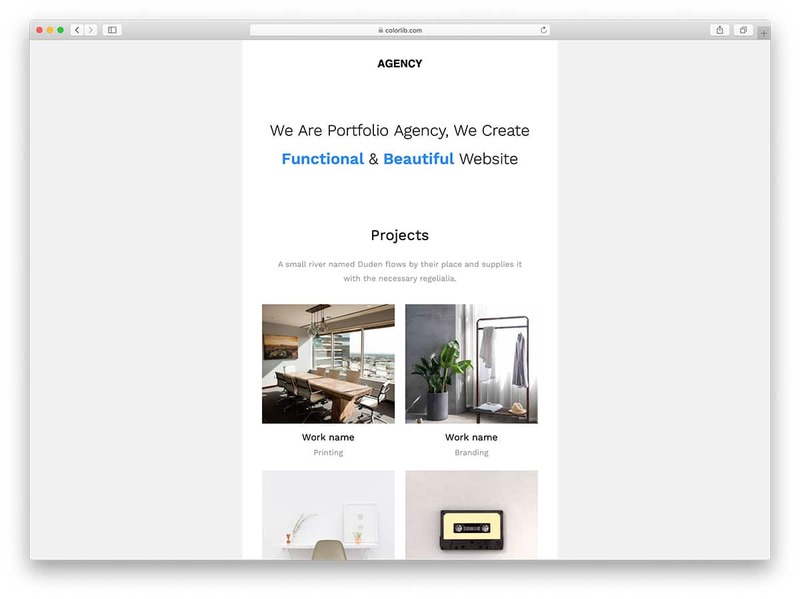 The simple design of this template helps you to neatly present both text contents and image contents, You can extract the HTML code from the MJML editor and can use it in your MailChimp email template builder. Photographer is a retro style simple email template. As the name implies this template is designed for the photography niche. 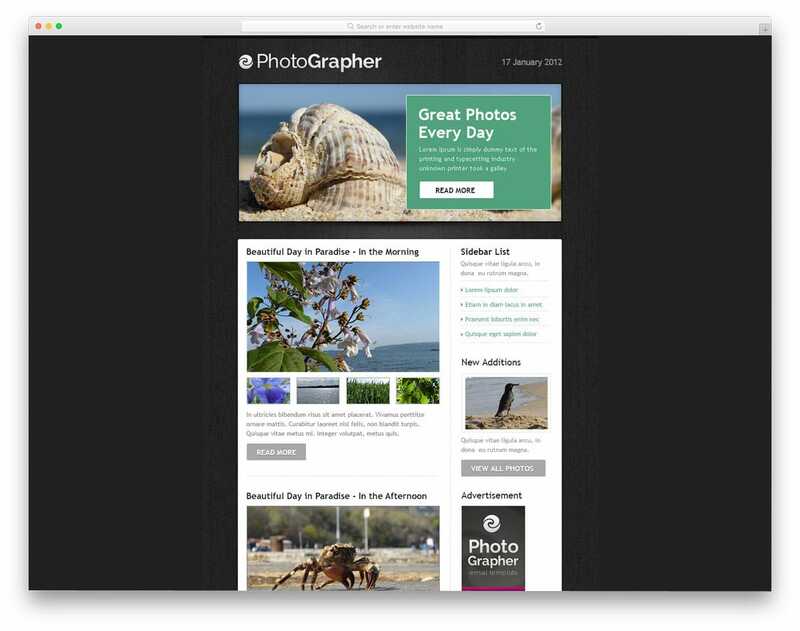 If you are running a photography blog or any other website related to photography this template could help you engage your audience. With the sidebar and proper segmentation, this template feels like a simplified version of a website template. You can use this template to share your story or weekly update of your blog. The creator of this template gives you the HTML file directly, which you can use to create your own template. 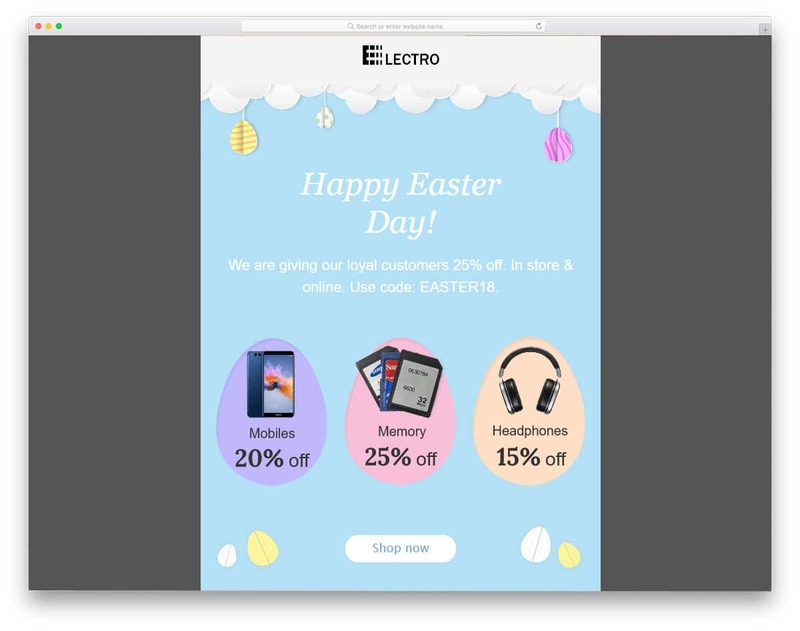 Electro is a promotion email template designed for the Easter festival, hence you can see lots of Easter eggs in its design. To set the festive mood, this template uses lots of colors in its design. Not only the colors the fonts are also selected with care to give a happy feel to the recipients. If you need you can edit this template either you can do it in the editor itself or if you are a developer you can use the HTML way to get a more precise result. In this template also the call to action button is placed at the end of the template. Since it is a seasonal promotional email, you can use the call to action button at the top as well. 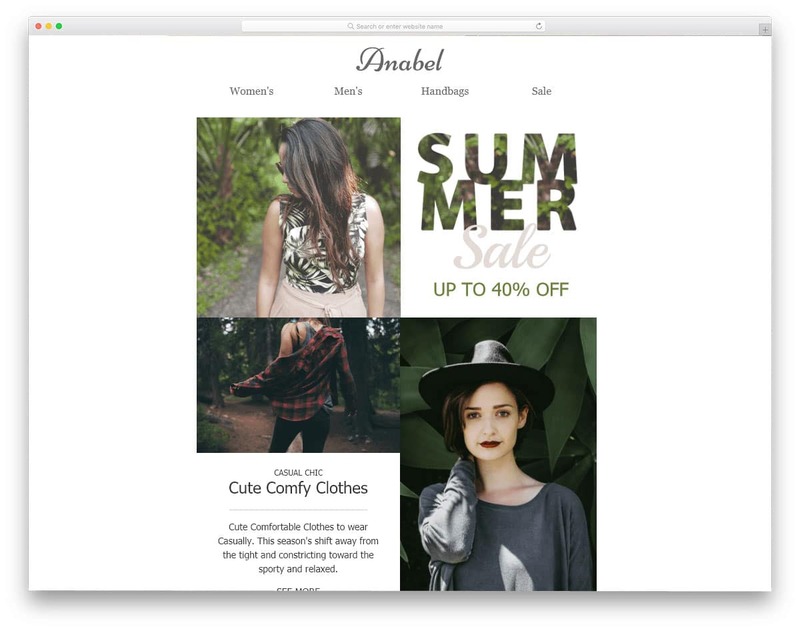 If you are running a fashion website or lifestyle website, this email template will definitely engage your audience. Since this template is for the fashion industry, the images are also made to look attractive. 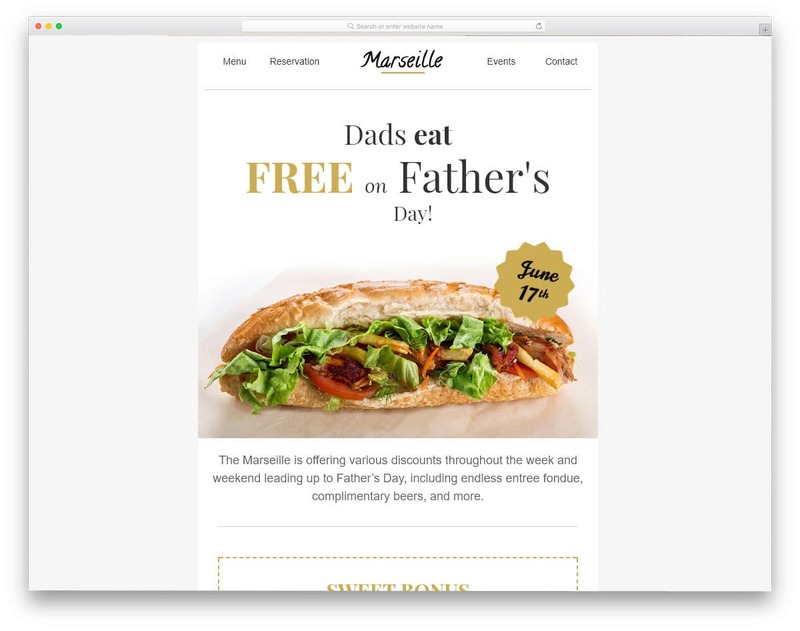 The Instagram style attractive image in the header gives you space to add texts so that you can show the offers as soon as the user opens your email. 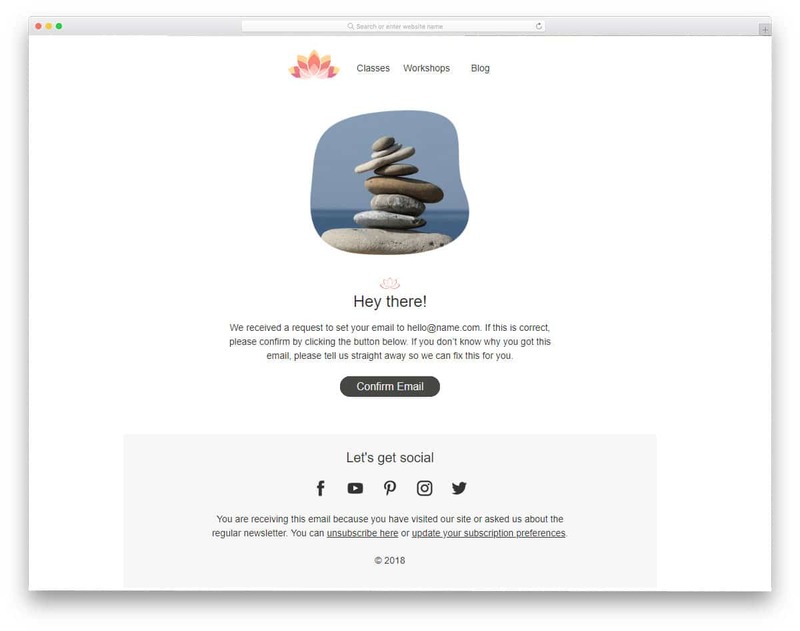 This template gives space for both images and texts in its design so you can create an engaging email, Call to action buttons are given below each product to take the user directly to the corresponding page directly, The big footer section gives you space to add important links, social media profile links, and other contact details. Engaging your customers periodically is a must if you are interested in building a customer and company bonding. Festivals and special days are the perfect occasions to reach your customers. This template is designed for the women’s day. If you are running a floral business, you can use this template as such without any change. If you are with any other type of business like apparel store, salon or anything else, try to make images that closely tell about your product or services and closely resembles your brand. Ample amount of space for texts are also given in this template so that you can be creative with words as well. If you are a SAAS company, this template is the best option for your email campaign. Many creative SAAS companies are adopting iconography design on their website. There are two reasons for that, one is the design is simple and the other is you can be creative with animation effects as well. The modern HTML5 and CSS3 framework give you more engaging visual effects. If you wish to follow the same design principal in the email templates as this template is the best option. 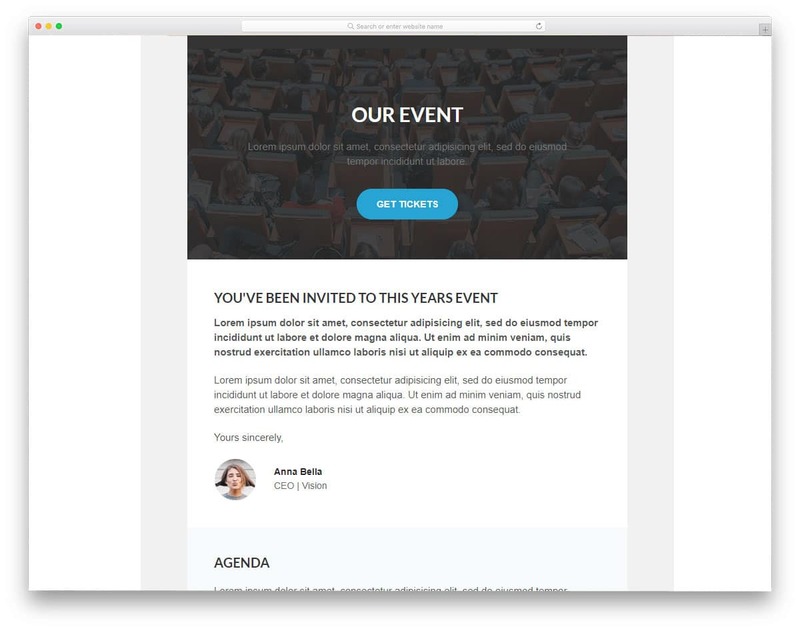 By default this template is designed for a corporate event, so you get colorful elements in this template, Talking about events, take a look at our event website template for more creative design inspirations. 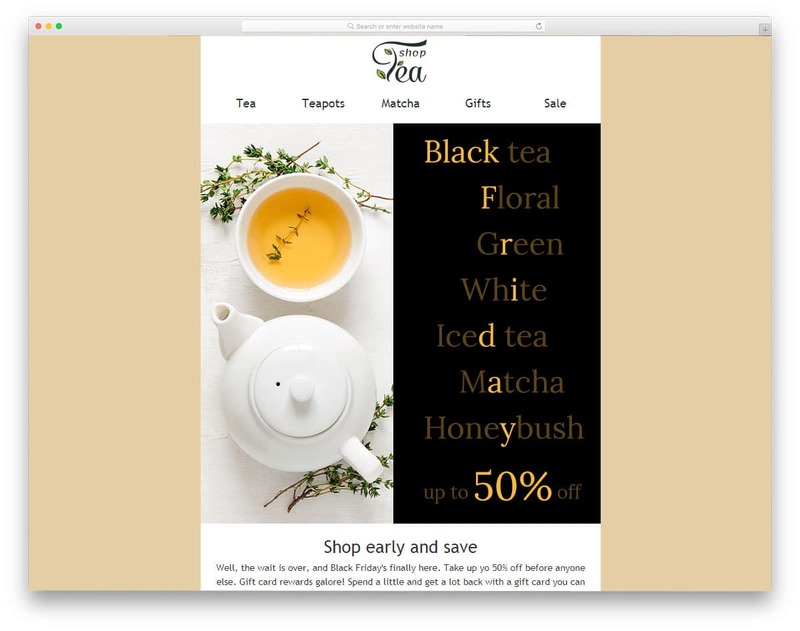 Teas Shop is a long email template, where you can add all your offers and other contents easily. Experts suggest that the short email tends to perform better than the long email because the user only spends a few seconds in the email. The designer of this template gives you an ample amount of space for both images and texts in its design If the conversion is the main goal of your email campaign, you have to customize this template a bit You can customize this template easily in the builder provided by the creator of this template and can export it to the MailChimp email builder.